Custom, high-performance Dead Bed & Wear Bars that optimize the life of your assets. Dead Bed & Wear Bars are designed to protect your equipment by transmitting impact and energy back into the material itself. Our Dead Bed & Wear Bars are manufactured in a variety of innovative designs custom selected for your application. The creation of dead beds to dissipate the energy of impact or reduce sliding abrasion is a traditional material handling technology. The use of Corrosion Engineering’s dead bed and wear bars makes the application of this technology more cost and performance-effective. Ask Corrosion Engineering how our dead bed and wear bars can increase profitability, productivity, and service life of your application. Dead bed and wear bars protect your equipment by transmitting impact and energy back into the material itself. 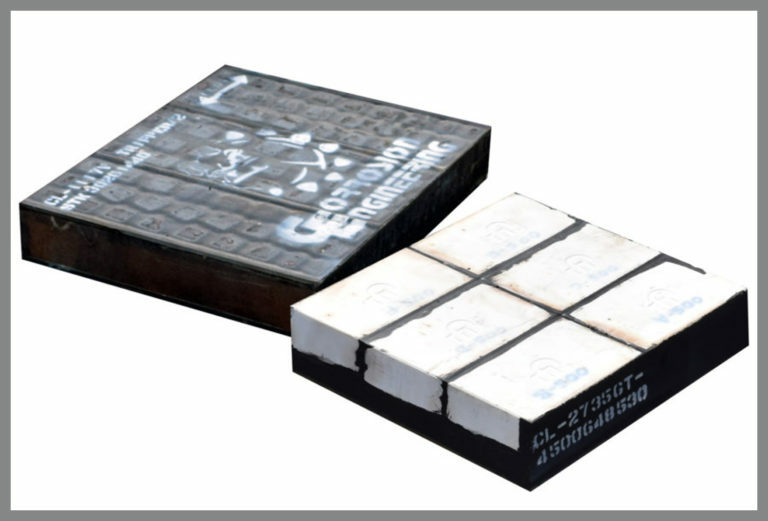 This material handling technology provides exceptional wear and abrasion resistance where edge and dead bed protection is required. Typical applications are in chutes, dead bed shelves, draw points, and above conveyor skirts at load points. Corrosion Engineering experts design these systems in ways that control material flow and velocity to protect downstream equipment from destructive wear. For decades, it has been proven that properly applied high-quality abrasion-resistant rubber delivers an operational service life several times greater than alloy steel billet traditionally used for dead bed and wear bars. Corrosion Engineering rubber dead bed and wear bars feature a durable, impact-absorbing rubber for superior protection of critical production equipment. Corrosion Engineering’s perfection of ceramic wear technologies have allowed us to offer ceramic dead bed bars that offer even longer life than rubber dead bed bars. The new and more demanding services are protected with our unique ceramic dead bed bar structure, which is comprised of structural steel and 500 BHN AR that further supports the dead bed bar and associated equipment from wear. Corrosion Engineering dead bed and wear bars can be mounted in a variety of ways, including weld studs, T-Bolts, offset flanges, and plug welding.